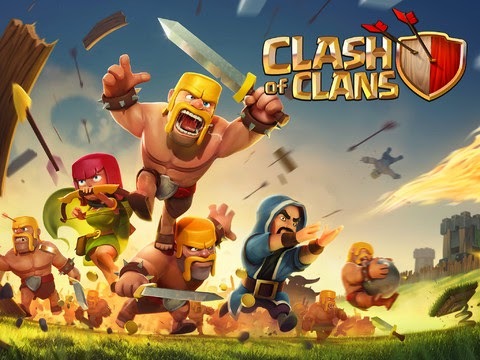 Clash of Clans has finally come to Android! It has long been an iPhone hit and will be the same on Android. The game is very similar to World of Warcraft, but after some initial game play allows Multiplayer action. You can make your own clan or join someone else's clan and team up. You can attack others and be attacked, which makes it more addictive than most games. You can also use the Link Device Option to play with multiple devices and even switch between your Android and iOS devices. The kids prefer to play it on the Nexus 10, which gives you lots of room and looks beautiful. Clash of Clans is free to download, but there are lots of opportunities to spend money with this game. In fact, my children have spent more on COC than any other app ever (by far). They started asking for Google Play gift cards for birthdays and holidays just to spend it on this game! My Valentine's gift FROM my children this year was also a Google Play gift card so I could upgrade my own Clan Castle to Town Hall 8 (known as TH8 in COC). There is a Global Chat in COC that does * out any curse words. In fact, it goes a bit overboard on this and will **** out regular words too. However, kids are smart and quickly learn to out smart the system and make their message clear without being censored. You can also REPORT inappropriate behavior, but it takes several players to report one before they are banned (temporarily) from chat. But I have found that SuperCell, COC's game maker, is very responsive to abuse reports made via their Parent's Portal. Always take a screenshot of the abusive behavior. My children are allowed to play this app, but I have seen all sorts of bad behavior on COC. In Global Chat gay bashing, sexual talk, general bullying and sharing of KIK accounts (to share photos outside the game) are very common, but it is clear that it is mostly a child just testing their limits. You can MUTE and REPORT that individual. Within a clan, mostly the atmosphere is friendly, since you need to play together to win. However the clan leaders can KICK you out, and that can be upsetting (even to adults!). If you thought Clash of Clans was fun, you should try Clash Royale! Especially if you can find a working Clash Royale hack Android which takes it to a whole new level. One of the best mobile games I've played in years! Net Nanny is the Android parental monitoring app is like a strict teacher: its main mission is to determine and block harmful Internet websites, dangerous contacts, and possibility to send messages to certain people. I believe that the best way to look for a child over 14 years old is a free spy https://www.hoverwatch.com/ . This application is very popular among parents. I also use it to monitor my little brother. DevelopTech is particularly into the development of mobile based applications and a number of applications developed by team of DevelopTech has helped the company to make its presence felt on the Google App Store. Mobile games can be the best tool for any one who wants to increase their sales and want to convert their leads into sales but for that you need to consult with custom game application developers in order to get the desired game app for your business needs. I have used an Iphone for the last four years, but i dont really liked cuz there aren't a lot of useful applications that I prefare to use. For example this tracking app https://mxspyphoneapp.com/ . But anyway thanks for this article, it was very interesting to read. Best tracking app can be downloaded from here. This is the best app for games and I must say that custom application development providers must use the same strategy. This was altogether finished with affectability to the day and age, so players won't wind up making utilization of beam firearms or other advanced weaponry in this diversion. Wonderful article. Game Killer Apk is an android app to modify any games to get unlimited coins, chips, gems, golds, diamonds, stars, woods, points etc.